Before the season even began, it was announced that newly promoted Atalanta would receive a 6 point deduction due to involvement with the Calcioscomesse scandal. Their captain, Cristiano Doni, was given a 3 ½ year ban and also arrested for his involvement in the scandal. But that only seemed to drive them to succeed. It was if they needed to prove themselves innocent on the pitch. All year, they’ve been a quiet success story, the 6 point penalty keeping them just under the radar, even though without it, they would sit just behind the 4-way tie for 3rd place. And as if that wasn’t enough, losing hometown hero Piermario Morosini on April 14th seems to have spurred them on even more, as they have not lost a match since. One hero fallen from grace, another hero fallen. For success in the face of adversity, they are unshakable adversaries. Of course, a team can’t win them all. And Milan have faced our own adversities. So tomorrow, we could shake the unshakable, if only for our own personal triumphs. 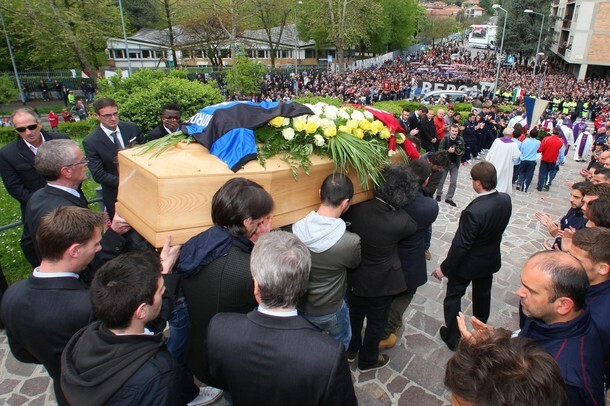 Atalanta last lost to Siena on Easter weekend and have since beaten Napoli, Catania, Chievo, and Fiorentina. So they are definitely tough. But if they were undone by Siena, and we dispatched Siena on Sunday, doesn’t that make us automatic victors? Okay, maybe not. But I certainly won’t lose any sleep if we break their streak, because they’ve got nothing to gain and we’ve got to win to have a chance at a second Serie A title. 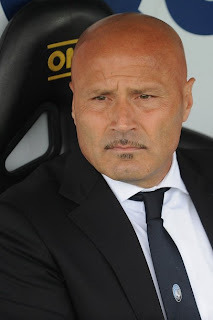 Stefano Colantuono is one of the few managers who has not been on the record breaking manager merry-go-rounds this season in Italy. In fact, he is the one who guided Atalanta back to Serie A in the first place, so it is wonderful to see his success in Serie A as well. They have achieved their highest point total ever in Serie A, with 46 points, so I’m sure they wouldn’t mind continuing their success against us. In their 2-0 win vs. Fiorentina on the weekend, he lined up Consigli; Manfredini, Lucchini, Peluso, Bellini; Carmona, Cazzola, Bonaventura, Schelotto; Denis, and Moralez. German Denis has a whopping 16 goals on the season, so it will be important to contain him. In fact, if you’ll remember from our January encounter, Denis was ahead of Ibra in the scoring before we last met. As for Milan, our injury list never really does go away, even if shrinking it to single digits does feel like we have a whole new team. Thiago Silva will still not be ready for Atalanta, and van Bommel should be suspended for his yellow card accumulation, so we are still missing 2 very important starters. However Nesta and Ambrosini were back in training with the group on Monday, so hopefully we will have them available. Ibra, Mexes, Seedorf, Yepes, and Zambrotta are all one card away from suspension. This will be important to avoid as we’ll need everyone available for the derby on Sunday. Let’s hope that by wearing the new kits, they will bring the squad luck. Heaven only knows that they are ugly enough not to be useful in any other way. My prediction for the first 11 victims to have to wear them on the pitch? Abbiati; Abate, Mexes, Nesta, Mesbah; Aquilani, Ambrosini, Nocerino; Boateng, Ibra, and Cassano. With that lineup, maybe the new kits won’t even bother me. Help me out, Allegri. We all know that even a win cannot guarantee us anything for this season of triumph and tragedy. But dropping points could seal our fate, so we really need to win no matter what. Atalanta are not going to roll over for us, in fact, beating us after our 2-0 defeat away in January would be the icing on the cake that has been their unshakable season. But for us, their colors will remind us of another adversary, slithering and lying waiting in the grass for us on Sunday. So in honor of black and blue week for AC Milan, I suggest we beat them both… well, black and blue.